"Talking Points," host Brian Kelly, aka The Points Guy, is joined by Linda Jojo, Executive Vice President for Technology and Chief Digital Officer at United Airlines to discuss what passengers can expect from our improved app. Read more about the improvements to the United app here. With the severe weather continuing to affect the Midwestern region, we will again reduce our schedule at Chicago's O'Hare Airport (ORD) through Friday morning. Safety is our top priority, and we are continuing to take every possible precaution to ensure our employees are safe while working in these extreme and severe conditions. We encourage customers who are traveling to, from or through the Midwestern region to check the status of their flights before heading to the airport, as well as visit united.com or use the United app for the latest updates and developments. Additionally, we have a travel waiver in place for customers traveling from, to and through O'Hare through February 1. With safety as our top priority, we are significantly reducing our schedule at Chicago's O'Hare Airport (ORD) beginning this evening through Thursday morning. We'll continue to monitor the weather situation and make additional changes to the schedule based on the conditions at the time. We encourage customers who are traveling to, from or through the Midwestern region to check the status of their flights before heading to the airport, as well as visit united.com or the United app for the latest updates and developments. We also encourage our customers to check their city's public transportation schedules when traveling to and from the airport for any disruptions in scheduling. Additionally, we have a travel waiver in place for customers traveling from, to and through Chicago O'Hare through February 1. As part of our ongoing commitment to putting customers at the center of everything we do, we identified boarding as an opportunity to improve the airport experience. Three months into "Better Boarding", and just in time for the busy holiday travel period, it's clear the new process is living up to its name. 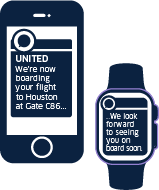 Customers with the United app can now receive a push notification once their flight starts boarding. Our goal is to provide customers with more information throughout the boarding process so that they will feel more at ease. Customers will only receive the notification if they've opted in for push notifications and have a mobile boarding pass in the app's wallet. Goodbye, five-lane boarding process. Hello, two-lane boarding process. By reducing the number of boarding lanes, there is more space for customers to enjoy the gate areas, many of which have been completely remodeled with more comfortable seating and in some airports, the ability to have food and drinks from within the airport delivered directly to the gate area. With the additional space, we've also been able to add additional seating to gate areas in numerous airports. Customer satisfaction as it relates to our boarding process has increased in the three months since we introduced Better Boarding. Better Boarding is just one of the steps we are taking to improve the customer experience. We will continue to collect feedback from customers on ways we can further improve boarding — you may receive a post-travel survey to tell us more about your experience. Lots of companies say they care about their customers. We want United customers to feel it. Every customer. Every flight. Every day. At United, we have big ambitions about what we can become, and we know this goal will only be achieved when "business as usual" is transformed into a new standard of caring for our customers. Starting today – just in time for Sunday's football game – every passenger on 211 United jets will be able to watch more than 100 channels of live TV for free. Seat back monitors make viewing easy gate-to-gate. This multimillion dollar investment will benefit the 29 million people expected to fly United's DIRECTV-enabled planes this year. Last week, United released a re-imagined version of the No. 1 most downloaded app in the airline industry. With a modern design and more engaging content, the app pushes the most helpful, up-to-the-minute information to the home screen at every step of a customer's journey, making it much easier to manage travel, from booking to landing. We're investing in modern airplanes that are even more reliable (meaning fewer delays) and more efficient (meaning fewer carbon emissions). We're also excited about some improvements (which we'll announce later this year) that will make traveling on them even more comfortable for our customers. By the end of this month, every one of our 90,000 United employees will have completed training in the core4 service principles that guide every interaction with our customers: safe, caring, dependable and efficient. These essential values are the foundation of the customer service culture we're building. And we're putting our money where our mouth is. There are now two ways every United employee earns bonuses: 1) beating our competitors with the best on-time departure performance and 2) improving customer satisfaction. United's shared purpose is "Connecting People. Uniting the World." We – as one United team – have embraced the opportunity to shape the culture of caring customer service that we want United to be known for. It won't happen overnight, but we're more confident than ever that we'll get there. As an airline, we've embarked on a journey that will reveal the character of our people and our passion for customer service. We invite you to join us on board.